The Marsdens and Les Chadwick first played skiffle together during the late 1950s. Like many of the Liverpool groups of their time they travelled to Hamburg and soon acquired the second 'Les', Maguire, on keyboards to complete the Pacemaker's classic line-up.They soon caught the attention of Brian Epstein and became the next group after the Beatles to join his 'stable'. The 1963 EP shown on the right (SEG8257) was Gerry & The Pacemaker's first on that format and was simply a coupling of their first two #1 hits. Despite this it sold relatively well and is among the easier EP releases by the group to find. Gerry & co. had the best start of all the contemporary groups, reaching the #1 spot with all three of their first releases- an achievement that stood unequalled for over two decades until fellow-Scousers Frankie Goes To Hollywood managed the same feat (on significantly smaller sales) in 1984.. The group gradually moved its style from the upbeat and cheeky to slow and sentimental- and were loved for all of it. Their rendition of 'You'll Never Walk Alone' became a football anthem, firstly by supporters of their own native Liverpool and then by those of England. The group lasted until 1967 after which Gerry started out as a solo performer. Although his presence disappeared from the chart he had by then become a loved performer and found work on the stage and TV. He returned to the public eye during 1987 when he was to lead a host of fellow musicians as the 'Crowd' in a re-make of 'You'll Never Walk Alone' in aid of those suffering after the fire at Bradford Football Club in 1985. Then, following the tragedy at the Hillsborough football ground in 1989 he remade 'Ferry Across the Mersey' with the same ideals in mind. 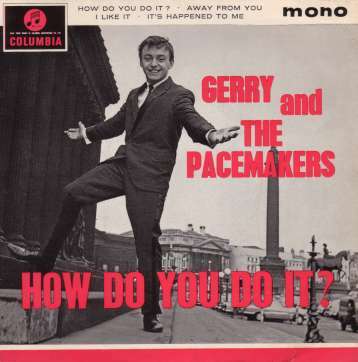 Gerry and the Pacemakers reformed with increasing frequency over the years and can be found as regular performers on 1960s nostalgia concerts. Columbia SEG8367 1964 "It's Gonna Be Alright"
Columbia SEG8388 1965 "Gerry In California"
Columbia SEG8397 1965 "Ferry Cross The Mersey"
Columbia SEG8426 1965 "Rip It Up"